The University of St. Thomas Music Department presents the Fall 2015 Monaghan Organ Recital. 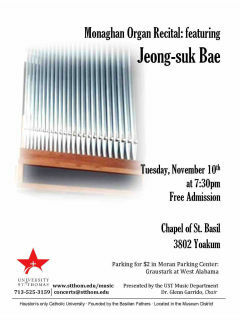 This year's featured artist is Jeong-suk Bae, the new UST Organ professor. The program will feature Organ works from the baroque, classical, and romantic eras of music by composers such as Bach, Beethoven, and Mozart. This performance will be held in the beautiful Chapel of St. Basil on the University of St. Thomas Campus.